Imelda is a group of five men of five distinct personalities who are fused by a common love for blues and hard rock. Imelda was formed from a previous musical project in 2011 and has been making-rounds in the university and bar scene playing at venues like the UP Fair, Saguijo, and Route 196 to name a few. In a word, Imelda is all about bringing back good ol’ Rock n’ Roll infused with a multitude of other influences from the music of today. Get a chance to experience the band for yourself on September 27, 2013 at Route 196, Katipunan Avenue Extension, Quezon City during the launch of their first-ever EP! . Attendees will be treated to a night of good music courtesy of other acts - The Squibs, Hansom, Nanay Mo, and PerkyWasted, good food and drinks, and a whole lot more! 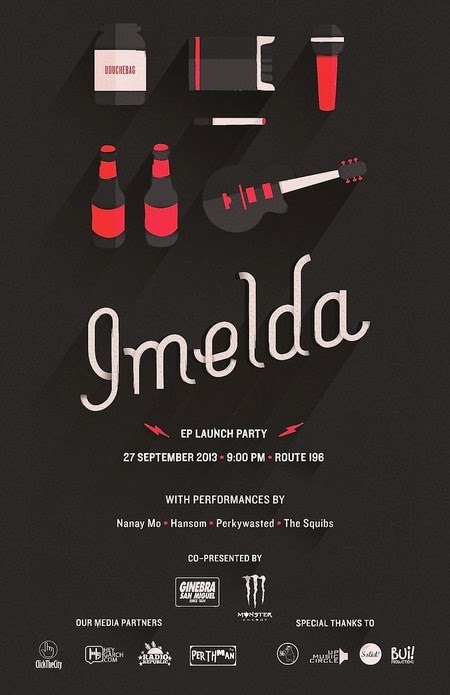 Php 250 gets you in and a copy of Imelda’s EP. Rock n' roll!